Facilities: FCI Schuylkill with an adjacent minimum security satellite prison camp. 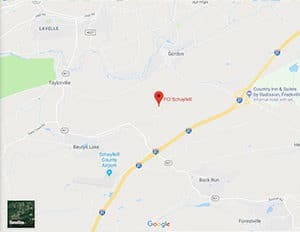 Location: FCI Schuylkill is located 100 miles northwest of Philadelphia; 46 miles northeast of Harrisonburg; west of I-81 off State Highway 901. Background: FCI Schuylkill was opened in 1991. It houses a unit for pre-trial detainees that was opened in 1992. Notable inmates include American rap artist Beanie Sigel (served two years for tax evasion), John Stanfa former boss of the Philadelphia Crime Family (serving a life sentence for multiple murders, kidnappings and other crimes), and organized crime leader James Coonan, (currently serving a 75 year sentence for murder, kidnapping, and other crimes) for dominating the Hell’s Kitchen area of New York City over a 20-year period. Housing: Inmates are housed in one of four housing units, which contain a number of two-person cells. Inmates at the camp are housed in dormitories in two-person cubicles. Health Services: Sick call, dental sick call, routine dental care, emergency medical treatment, medications, physical examinations upon admission and release, preventative health care examinations, optometry, and flu vaccines for inmates are available to inmates. Emergency medical care is available 24 hours a day. Psychology Services: All FCI Schuylkill inmates must complete a Psychology Services screening. If a crisis exists, any staff member can contact a member of the Psychology Department for inmates. Inmates can also talk with a member of the Psychology Department at mainline. Priority services include suicide prevention, intake screening, the treatment of major mental disorders, and crisis intervention. Other services may include adjustment counseling, short-term individual counseling, and group therapy. The Psychology Department provides educational and therapeutic groups that address special concerns faced by inmates. The group schedule and classes varies and have previously included Criminal Lifestyles, Relapse Prevention, and Anger Management. Residential Drug Abuse Program (RDAP): FCI Schuylkill houses a Residential Drug Abuse Program (RDAP). The camp does not house a Residential Drug Abuse Program (RDAP). A Drug Abuse Program, Drug Abuse Education class, the Non-Residential Drug Abuse Program (NR-DAP), a 12-Step Group, and Alcoholics Anonymous (AA) are also available. Education Services: FCI Schuylkill provides literacy, GED, and English-as-a-Second Language (ESL) programs. Pre-release, parenting, and Adult Continuing Education (ACE) programs are also available to the inmate population. An incentive award of $25.00 is given upon completion for both the GED and ESL programs, including a graduation ceremony, certificates of achievement, a tassel, and two cap and gown photos. Additional certificates are given upon completion of specific achievement levels, or when selected as “Student of the Month.” High school diplomas and post-secondary programs are available through paid correspondence programs. Advanced Occupational Education: FCI Schuylkill offers advanced occupational education in Basic Residential Wiring and Culinary Arts. The camp offers advanced occupational education in Commercial Driver’s License Class A, Horticulture, and Landscaping. Vocational Training: FCI Schuylkill and the camp do not offer any vocational training aside from the advanced occupational education and apprenticeship programs. Apprenticeship: FCI Schuylkill and the camp offer an apprenticeship in Cooking. Library Services: FCI Schuylkill offers both a leisure and law library. The leisure library includes newspapers, magazines, periodicals, and reference books. An interlibrary loan program is also available. Inmates can use the law library to conduct legal research through TRULINCS Electronic Law Library terminals. Federal Register documents, institution supplements, and the Black’s Law Dictionary are maintained in hard copy format and in the main law library and in the Special Housing Unit. Typewriters and a photocopier are available for inmate use. UNICOR: The FCI Schuylkill UNICOR facility produces office furniture. The camp does not house a UNICOR facility. Commissary: Inmates are allowed to spend $360.00 monthly in the commissary on their assigned shopping days. Clothing, shoes, food, drink mixes, and other items are available for purchase. Spending limits on certain items may apply. Recreation Services: The Recreation Department at FCI Schuylkill consists of three areas: a gymnasium, outside recreation yard, and Leisure Center (arts and crafts/music areas). provides Activities include basketball, racquetball, bocce ball, soccer, handball, volleyball, horseshoes, jogging/walking, softball, wiffle ball, flag football, indoor floor hockey, physical fitness, and health education programs. Leisure activities include table games include backgammon, bid whist, billiards, gin, checkers, dominoes, foosball, chess, spades, table tennis, bridge, and pinochle. A music program and arts and hobbycraft are available, as well as special programs and activities throughout the year (e.g., movies, holiday sporting events, tournaments/contests, and inmate music shows). In the camp, the indoor recreation area has a hobby craft area, weight room, a music room, and a game room with various table games. The outdoor recreation yard offers a softball field, basketball courts, bocce court, a weight lifting area, handball/racquetball courts, a volleyball court, and several horseshoe pits.